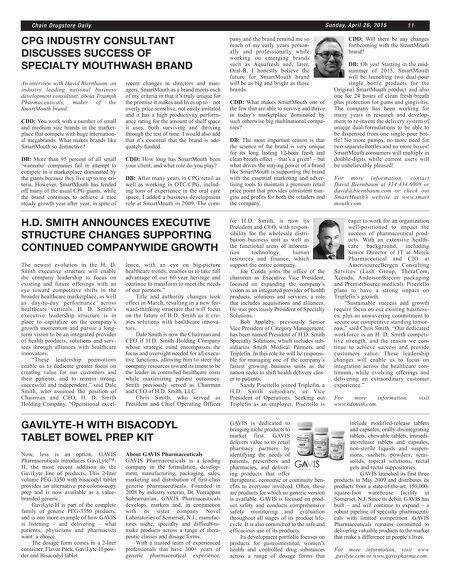 C h a i n D r u g s t o r e D a i l y 1 1 S u n d a y, A p r i l 2 6 , 2 0 1 5 CPG INDUSTRY CONSULTANT DISCUSSES SUCCESS OF SPECIALTY MOUTHWASH BRAND An interview with David Biernbaum, an industry leading national business development consultant, about Triumph Pharmaceuticals, maker of the SmartMouth brand. CDD: You work with a number of small and medium size brands in the market- place that compete with huge internation- al megabrands. What makes brands like SmartMouth so distinctive? DB: More than 95 percent of all small 'wannabe' companies fail in attempt to compete in a marketplace dominated by the giants because they live up to my cri- teria. However, SmartMouth has fended off many of the usual CPG giants, while the brand continues to achieve a nice steady growth year after year, in spite of recent changes in directors and man- agers. SmartMouth as a brand meets each of my criteria in that it's truly unique for the promise it makes and lives up to – not overly price-sensitive, not easily imitated and it has a high productivity perform- ance rating for the amount of shelf space it uses, both surviving and thriving through the test of time. I would also add that it's essential that the brand is ade- quately funded. CDD: How long has SmartMouth been your client, and what role do you play? DB: After many years in CPG/retail as well as working in OTC/CPG, includ- ing tons of experience in the oral care space, I added a business development role at SmartMouth in 2009. The com- pany and the brand remind me so much of my early years person- ally and professionally while working on emerging brands such as Aquafresh and, later, Oral-B. I honestly believe the future for SmartMouth brand will be as big and bright as those brands. CDD: What makes SmartMouth one of the few that are able to survive and thrive in today's marketplace dominated by such otherwise big multinational compa- nies? DB: The most important reason is that the science of the brand is very unique for its long lasting 12-hour fresh and clean breath effect – that's a given! – but what drives the staying power of a brand like SmartMouth is supporting the brand with the essential marketing and adver- tising tools to maintain a premium retail price point that provides consistent mar- gins and profits for both the retailers and the company. CDD: Will there be any changes forthcoming with the SmartMouth brand? DB: Oh yes! Starting in the mid- summer of 2015, SmartMouth will be launching two dual-pour single bottle products for the Original SmartMouth product and also one for 24 hours of clean fresh breath plus protection for gums and gingivitis. The company has been working for many years in research and develop- ment to re-invent the delivery system of unique dual-formulations to be able to be dispensed from one single-pour bot- tle! No more pumps, no more need for two separate bottles and no more boxes! SmartMouth consumers will multiply in double-digits while current users will be unbelievably pleased! For more information, contact David Biernbaum at 314.434.6008 or david@biernbaum.com or check out SmartMouth's website at www.smart mouth.com. H.D. SMITH ANNOUNCES EXECUTIVE STRUCTURE CHANGES SUPPORTING CONTINUED COMPANYWIDE GROWTH The newest evolution in the H. D. Smith executive structure will enable the company leadership to focus on existing and future offerings with an eye toward competitive shifts in the broader healthcare marketplace, as well as day-to-day performance across healthcare verticals. H. D. Smith's executive leadership structure is in place to capitalize on the company's growth momentum and pursue a long- term vision to be an integrated provider of health products, solutions and serv- ices through alliances with healthcare innovators. "These leadership promotions enable us to dedicate greater focus on creating value for our customers and their patients, and to remain strong, successful and independent," said Dale Smith, who assumed the position of Chairman and CEO, H. D. Smith Holding Company. "Operational excel- lence, with an eye on big-picture healthcare trends, enables us to take full advantage of our 60-year heritage and continue to transform to meet the needs of our partners." Title and authority changes took effect in March, resulting in a new for- ward-thinking structure that will focus on the future of H.D. Smith as it cre- ates solutions with healthcare innova- tors. Dale Smith is now the Chairman and CEO if H.D. Smith Holding Company whose strategic mind encompasses the focus and oversight needed for all execu- tive functions, allowing him to steer the company resources toward its intent to be the leader in controlled healthcare costs while maximizing patient outcomes. Smith previously served as Chairman and CEO of H.D. Smith, LLC. Chris Smith, who served as President and Chief Operating Officer for H.D. Smith, is now its President and CEO, with respon- sibility for the wholesale distri- bution business unit as well as the functional areas of informa- tion technology, human resources and finance, which support the entire company. Joe Conda joins the office of the chairman as Executive Vice President, focused on expanding the company's vision as an integrated provider of health products, solutions and services, a role that includes acquisitions and alliances. He was previously President of Specialty Solutions. Bob Appleby, previously Senior Vice President of Category Management, has been named President of H.D. 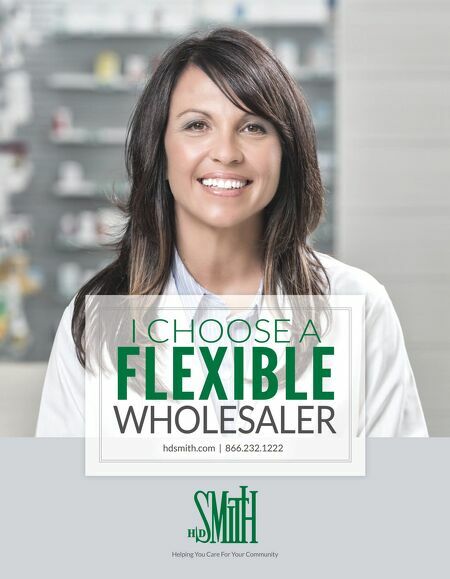 Smith Specialty Solutions, which includes sub- sidiaries Smith Medical Partners and Triplefin. In this role he will be responsi- ble for managing one of the company's fastest growing business units as the nation seeks to shift health delivery clos- er to patients. Sandy Piscitello joined Triplefin, a H.D. Smith subsidiary, as Vice President of Operations. Seeking out Triplefin as an employer, Piscitello is eager to work for an organization well-positioned to impact the success of pharmaceutical prod- ucts. With an extensive health- care background, including Senior Director of IT at Merck Pharmaceutical and CIO at AmerisourceBergen Consulting Services (Lash Group, TheraCom, Xcenda, AndersonBrecon packaging and PremierSource medical), Piscitello plans to have a strong impact on Triplefin's growth. "Sustainable success and growth require focus on our existing business- es, plus an unwavering commitment to secure our competitive standing tomor- row," said Chris Smith. "Our dedicated workforce is an H. D. Smith competi- tive strength, and the reason we con- tinue to achieve success and provide customers value. These leadership changes will enable us to focus on integration across the healthcare con- tinuum, while evolving offerings and delivering an extraordinary customer experience." For more information, visit www.hdsmith.com. GAVILYTE-H WITH BISACODYL TABLET BOWEL PREP KIT Now, less is an option. GAVIS Pharmaceuticals introduces GaviLyte™- H, the most recent addition to the GaviLyte line of products. This 2-liter volume PEG-3350 with bisacodyl tablet provides an alternative pre-colonoscopy prep and is now available as a value- branded generic. GaviLyte-H is part of the complete family of generic PEG-3350 products, and is one more example of how GAVIS is listening – and delivering – what patients, physicians and pharmacists want: a choice. The dosage form comes in a 2-liter container, Flavor Pack, GaviLyte-H pow- der and Bisacodyl tablet. About GAVIS Pharmaceuticals GAVIS Pharmaceuticals is a leading company in the formulation, develop- ment, manufacturing, packaging, sales, marketing and distribution of first-class generic pharmaceuticals. Founded in 2008 by industry veteran, Dr. Veerappan Subramanian, GAVIS Pharmaceuticals develops, markets and, in conjunction with its sister company Novel Laboratories of Somerset, N.J., manufac- tures niche, specialty and difficult-to- make products across a range of thera- peutic classes and dosage forms. With a trusted team of experienced professionals that have 300+ years of generic pharmaceutical experience, GAVIS is dedicated to bringing niche products to market first. GAVIS delivers value to its retail pharmacy partners by identifying the needs of patients, prescribers and pharmacies, and deliver- ing products that offer therapeutic, economic or continuity ben- efits to everyone involved. Often, these are products for which no generic version is available. GAVIS is focused on prod- uct safety and conducts comprehensive safety monitoring and evaluation throughout all stages of its product life- cycle. It is also committed to the safe and efficacious use of its products. Its development portfolio focuses on products for gastrointestinal, women's health and controlled drug substances across a range of dosage forms that include modified-release tablets and capsules, orally-disintegrating tablets, chewable tablets, immedi- ate-release tablets and capsules, non-sterile liquids and suspen- sions, sachets, powders, semi- solids, topical solutions, rectal gels and rectal suppositories. GAVIS launched its first three products in May 2009 and distributes its products from a state-of-the-art, 150,000- square-foot warehouse facility in Somerset, N.J. Since its debut, GAVIS has built – and will continue to expand – a robust pipeline of specialty pharmaceuti- cals with limited competition. GAVIS Pharmaceuticals remains committed to delivering valuable products to the market that make a difference in people's lives. For more information, visit www .gavilyte.com or www.gavispharma.com.